Hey, Bloggers! It's Wednesday and also the first day of summer break for my oldest daughter. I'm looking forward to spending more time with her while she's on break. Tuesday night, we painted our toenails and watched a movie while having kettle corn and M & M's. I really do enjoy our girl time together! I turned to my trusty Copics to ink her up. I added pink Stickles to the flower in her hair and orange Stickles to the butterfly. I used Glossy Accents on her bikini top. 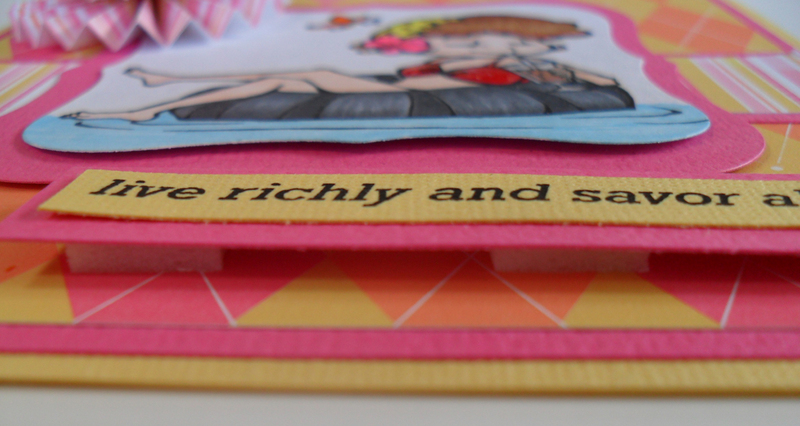 Then, I turned to my stash to put the card together. Now, I know a lot of you are probably like me. I tend to be more of a scrapbook supply collector than anything else! *sigh* Well, no more of that ! I'm determined to dust off some of my tools and supplies and USE them! So, I turned to my Nestabilities Labels One set to cut out this image. I can't even remember the last time I used that set! 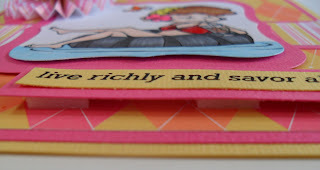 For the patterned paper, I found some bright, fun paper in my stash. Then, I took out one of my Tim Holtz rosette dies. I actually own both rosette dies. One die has one rosette and the other die has two, smaller rosettes. I used the die with the two small rosettes. I think the last time I used this die was almost a year ago. 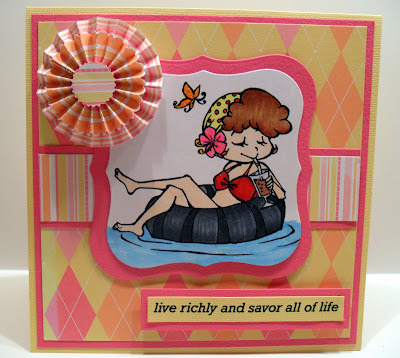 I layered one rosette on the other and then placed them in the upper left corner of the card to resemble the sun. I initially tried to stamp the sentiment using a Hero Arts stamp, but I didn't like how it looked. So, I typed it out on the computer and printed it out. I then matted it and raised it on pop dots to help balance out the card a bit. 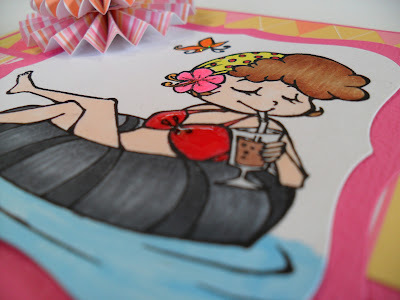 I'm really happy that I used my Tim Holtz die, Nesties, and this paper from my stash! Not only am I trying to force myself to use my stuff, but it's also a good way to get me to do different things with my cards. Well, hope you all have a fun day today. Thanks so much for stopping by. Aloha! OMGeeee... how adorable is this, girl?? Yes, she does look like she is enjoying herself!! Looking forward to the summer and the fun we should be having at the beach, because I don't know if I can contain the kids here all day! Can't wait!! Only thing, that means too much sand in my car!!! Ack!!! So love this image!! I will have to check out Lollipop Crafts!! Hoping your day is blessed throughout!! What a darling card. And so great to use your stash. We should all be doing that, LOL.